Ibrox Noise: Did Steven Gerrard make a big mistake with striker? Did Steven Gerrard make a big mistake with striker? With Rangers’ struggles to secure Kyle Lafferty ongoing amidst the well-known lack of depth up front at Ibrox, we do wonder if Steven Gerrard made a bit of an error with Jason Cummings. 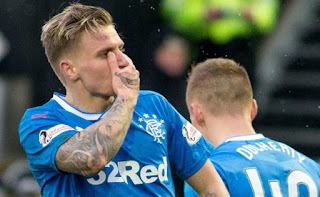 The 23-year old striker was a huge favourite here at Ibrox Noise, with his exemplary attitude and no small ability making him someone we were keen to tie up permanently. Unfortunately, SG wasn’t interested, and with his start to life at Peterborough (two appearances, a goal and an assist), we really do wonder if we’d have been better served holding onto the former Hibs striker. With Umar Sadiq’s uncertain start to life at Ibrox (he has the ability and presence, but as yet hasn’t quite blended in to say the least), Cummings would have been a low-cost and useful striker to keep among the squad, someone we could rely on to work hard and score goals. He’s shown already in England that he’s capable if given a chance. He simply wasn’t at Forest – Warburton signed him and then dumped him (did that plenty with players at Ibrox) before Aitor Karanka decided to have a genuine vendetta against him. So he’s at Peterborough and showing the ability to deliver. We’re not pretending he’s a better striker than Lafferty – he’s 10 years his junior and a very different mould of front man. But he could have been a very useful forward to have on the books, and it’s Peterborough instead benefiting. Cummings showed at Ibrox that the shirt wasn’t too big for him – he thrived on the spotlight and was criminally wasted by Murty. We can’t help wondering if his exit was a mistake. Perhaps we should have worded it as a rough decade. Cummings never done all that much when he was here,and the loan striker role does not suit him. Cummings has failed to establish himself anywhere since he left Hibs, and he wasn't a standout while he was here last season. The quality of players here now are, in my opinion, a level above Cummings. SG seems to want players who are physically strong, and I don't think Jason falls into that category. A decent enough player who works hard, but not at the level we need. He's scored one goal in two games in the English lower leagues after failing in the Championship. That's it. He didn't do it up here and he had more chances than Sadiq has had yet. Forget Cummings. Lets get behind Sadiq. Agree with Olly, Jason is a good player who does not suit the system Rangers play now. I think Cummings could have been a decent option. BUT, no Championship manager wanted to take a punt on him, he is not suited to the lone striker role and several managers at Rangers didn't fancy him. At this point, I have no evidence to show that SG is less than Godlike in his decisions, so until a piece of evidence appears to prove him fallible, I will back him. Even if he signs Lafferty!!! Despite most of us wanting to see Cummings do well he just wasn't good enough. 2 goals in the 6 or 7 league starts he had isn't exactly setting the heather on fire and there were few games where he really impressed. Unfortunately I think Gerrard made the right descision here. We should have held on to Cummings! Good Goalscorer for Scottish Leagues. Was never given a Fair Chance! s and buts get us nowhere. Forget Lafferty, put an offer into Motherwell for Curtis Main. Screw, Levein. The grasping beardy that he is. Joe you're not listening. Check Main's goal scoring record. It is nowhere near good enough for Rangers. Nor Moult. I think people (including IN) are blinded by his enthusiasm and all round ‘wanting to play for Rangers’ attitude rather than his ability and goal scoring prowess for a big team such as Rangers. More so, he’s never a lone striker hence why he’s not at Ibrox. Can't believe folks are still on about this. If JC gets 15-20 goals for Posh this season then he should be able to do the same in the SPL. To date, there is no evidence to suggest that he can do it consistently at any level above the Scot Championship. As for "he wasn't given a chance" by us or Forest, clearly he hasn't shown that he deserves one - the management see the players every day! !